A. Village wood is wood from trees that are planted or growing wild which are not governed by the master of forestry. The trees are classified as timber village did not undergo certain procedures before a decent cut down and used as furniture. TPK wood is wood from trees that are planted or grown wild controlled and treated by the master of forestry. Trees of this class must undergo a certain process and qualified before the cut. The wood of high quality because TPK class must pass a certain age requirement before permission logging. Wood is dried before it is felled TPK i.e. He will be injected with chemicals to death and left to dry for at least one year before being cut down and used as furniture. B. Both categories of timber village and wood TPK will be divided based on the class numbers 1-3. As a guide to understand, we classify wood ward as Grade B (B1, B2, B3) and wood TPK as Grade A (A1, A2, A3). There is also a wood is classified as class C, but the wood in this class are not qualified and are rarely sold in our furniture gallery. To identify quality wood A, B or C, the easiest way is to examine when the timber is still not in doing the coloring. In addition, you need to be skilled in researching the best wood fibres. 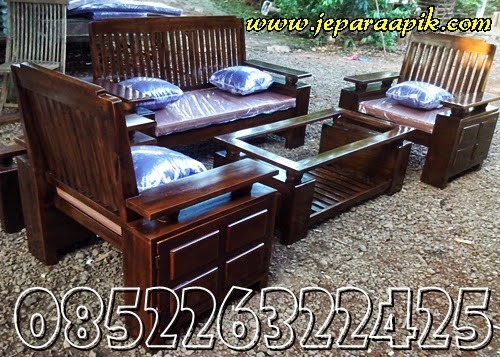 Most teak furniture distributor in Malaysia to sell furniture from wood because of class B class A very expensive. But there is also a mix of furniture Grade B Grade C and low quality. In our Furniture, only sells furniture from quality Grade B1-B3 and a little bit of Class A3. There are also customers who make the choice to furniture from class A2 and A1. As an easy guide, we list some tips on choosing furniture from teak wood so that our customers are satisfied with the quality of any purchased items. Quality furniture has a smooth surface including the dicelah cavity of radius or carving furniture. Usually the bottom or base of the furniture does not puree and left rough. In General, low-quality wood furniture is a bit difficult in puree especially in the cavity carved niches. Quality wood fibres is more straight and smooth. The term is often used in Indonesia is its wooden look ' smooth '. More smooth and straight grain of the wood, then he is more qualified. Wood quality and overall surface has a mottled color evenly. Low-quality wood look spotted, there is a section that looks kinda white and some are darker. For a guide, visible white wood is rather soft wood from the nearest to the bark. White wood is also usually made of wood that is young and not durable. Often, it is rather difficult to define quality with attention to color the wood because it has been tinged with varnish. In General, dark brown colored wood is better than the wood which is rather young. However, at the various coloring techniques for wooden, somewhat difficult to determine the quality by looking at the furniture is ready. The best way is to pay attention to the color of wood before he dipped/varnish. By the way, have fooled vending with techniques that says dark colored furniture that are more qualified. This is because you need to pay attention to the original color of the wood before it divarnish. Veins of wood, try to pay attention to the eyes of the wood. Wooden eye is part of the trees that give off branches. It looks like a small whirlpool. Usually hollow wooden eyes naturally. But Carpenter has a variety of techniques to close the eye hole wood. Therefore, pay attention to the packaging in the eyes of the wood so that it does not break forth in times to come. Ideally, choose furniture that has no eyes of wood. Quality wood furniture is usually look pretty and neat. The wood connection technique is precise and powerful. Because of teak furniture is made entirely by hand, then there is usually a little disability is minimal. Therefore, select the most furniture is less level of disability. There is a perfect 100% furniture, usually it is very expensive and is made from Grade A quality wood. The percentage of moisture content in wood is the most important thing in determining the quality of furniture. Wood has natural properties that will shrink when it gets dry. Therefore, most wood will break, cracking or curved when it dries and shrinks. To ensure the wood is dry, you should choose furniture that has undergone systematic drying process. In addition to natural drying technique with a clothesline, there is now a new technology using giant ovens where the wood will be heated in the oven for 3 days until dry enough and quality. Warranties give you peace in investing your savings to have furniture. Keep in mind, all teak furniture has a risk of damage even if you buy a quality wood furniture from the most high. This is the nature of wood that might break out, broken or cracking. Therefore, the guarantee of the distributor is very important to make sure you buy the right stuff. Teak wood furniture is usually strong and sturdy structure. However, the various design changes, there is furniture that has a structure that is rather weak, especially Dining chairs. Therefore, you need to pay attention to the structure of the furniture before you buy it. tag: jepara mebel minimalis, jepara mebel export, jepara mebel jati, jepara mebel ukir, jepara mebel art, jual jepara mebel, khusnah mebel jepara, mebel indoor, furniture rumah minimalis, furniture minimalis murah, furniture murah, furniture jati, furniture jepara, furniture olympic, pengertian furniture.